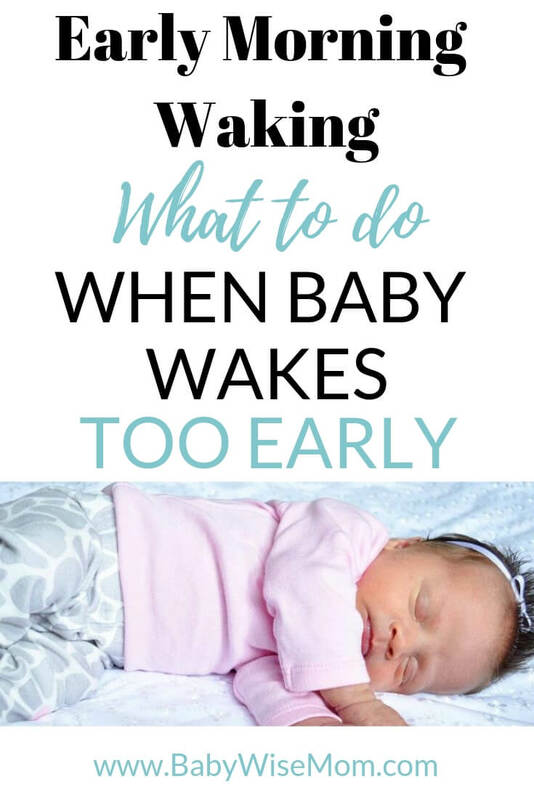 Early Morning Wakings: What to do when baby wakes early. Reasons baby might be waking early in the morning and how to solve it and get baby sleeping through the night. Your baby can wake early in the morning before your desired wake time for a variety of reasons. It often happens when baby is extending night sleep and making it longer between feedings in the middle of the night. The baby who was waking at 3 AM to eat moves that feeding to 4 AM, then 5 AM, then 6 AM. These are considered night wakings. Parents are left wondering what to do when baby is waking so close to the official first feeding of the day. You can read all about that in my 5-6 AM “Night” Wakings post. Baby can also be waking up early in the morning because of a sleep regression, teething, or pain. Baby might be waking up because the dreamfeed needs to be dropped or because the swaddle needs to be dropped. There are a whole variety of reasons for early waking. Parents naturally want to know what to do about their little one waking early in the morning. The answer to that depends on why baby is waking early. Therefore, your first step is to figure out why baby is waking early. Once you know why, you can make a plan of action. Your solution for a baby waking early because of teething pain will be different than for a baby waking early because the dreamfeed needs to be dropped. Look at the list I have for you there. Your task is to decide which of those reasons is the reason your baby is waking early. There will be some things you can scratch off the list. If you try to feed baby and baby refuses to eat, you can cross growth spurt off the list. If baby is waking with no sun up OR with blackout curtains in the room, you can cross that off. There will be plenty of things you can’t cross off, however. Cross off what you can and then look at the list and go with your gut. Listen to your mommy instinct and pick one thing you think it is. Then you experiment. You try to solve that issue and ONLY that issue. Do not try to solve even two at a time. You need to isolate variables so you can figure out what the reason for the early waking is. Think scientific method. So much of being a parent is being a scientist. Experiment with that one solution. I am a big advocate for taking notes as you problem solve (I have a lovely Book of Logs you can purchase if you need help tracking the right things). Once you have tried that solution for a few days, if you still have early morning waking, reset and try the next idea. Some causes for early morning waking are more likely to apply in different situations. A baby who was sleeping through the night but is now having early morning wakings is more likely to be having a growth spurt than the baby who was waking at 4 AM and is now waking at 6 AM. So as you consider which issue is your baby’s reason for early morning waking, take into account the pattern of your baby’s night sleep up to this point. Baby will not have been sleeping through the night consistently before this happening. This is super, super common. A baby will naturally extend time between the last feeding of the day and feedings during the night. Feedings will creep to be closer and closer to early morning hours. It is so common I have a whole post on it, so be sure to read up on 5-6 AM “Night” Wakings to know what to do. If this is the reason your baby is waking early, take it as a great sign! Baby is getting closer to sleeping through the night. Know that it is very typical for a baby to sleep through the night, then wake up at 6 AM for a night or two, then sleep through again, then wake up at 5:30 AM, then sleep through the night again. If this is happening, it is normal and nothing to worry about. Baby will likely not have been sleeping through the night for a time if this is the reason for the early waking. The circadian rhythm determines natural sleep cycles. Different people are more early bird types while others are more night owl types. Still other people are low sleep needs and others are high sleep needs. These things are true of babies as well. You might have a low sleep needs baby who is an early bird. Decide what is a reasonable time for an early bird to get up at your house. Keep in mind this will be the normal wake up time for most of your child’s life. Our oldest, Brayden, has always been a low sleep needs person who wakes up early. He is almost 14 and I can count on one hand the number of times I have slept until 8 AM since his birth. I set his morning wake up time at 7 AM. He often woke earlier than that, but just happily waited in his bed until I got him at 7. One trick to making this work is to not feed baby until after your desired wake up time. I did not feed Brayden breakfast at 6:30 AM. I always waited until 7 AM. This helps hunger patterns be set to 7 AM. So if you have a baby who wakes crying and you can’t leave baby in the crib, still wait to feed baby until after the time you have decided is reasonable. You can help set internal clocks by having some time in the sun each day, especially around noon. You can also help with natural rhythms by being very aware of how bedtime impacts morning wake up time for your child. Again, take notes! Let me add, there are perks to a naturally early waker. Even though Brayden is a teenager, we have never had to drag him out of bed in the morning. He is up easily every morning and wakes naturally on his own. If baby is having a growth spurt and waking early in the morning, baby could have been sleeping through the night and is not anymore. Baby also can have not slept through the night yet. If baby is waking early from a growth spurt, you always want to feed baby. You want to feed a hungry baby. You can try to add in another feeding during the daytime to try to get baby to not need to wake in that early morning. If baby eats solids, you can try to increase the amount of solids eaten. A good way to test this is to feed baby and see what happens. If baby eats well and then eats well for the first feeding of the day, there is a good chance it is a growth spurt going on. If baby eats well but does not eat for the first feeding, it probably wasn’t really hunger and baby could move back that early morning feeding closer to match up with the desired first feeding of the day. Read more about Growth Spurts here. Baby can have been sleeping through the night for this to be the reason for early waking. Baby also can have not slept through the night yet. As baby either gets older and needs less sleep in a 24 hour period or baby starts taking longer daytime naps, you might find baby is waking in the night because there is too much daytime sleep happening. Make sure you follow the Eat, Wake, Sleep Cycle each day. If you have a baby who has a hard time staying awake, make sure you are making an effort to add waketime to each cycle in the day. 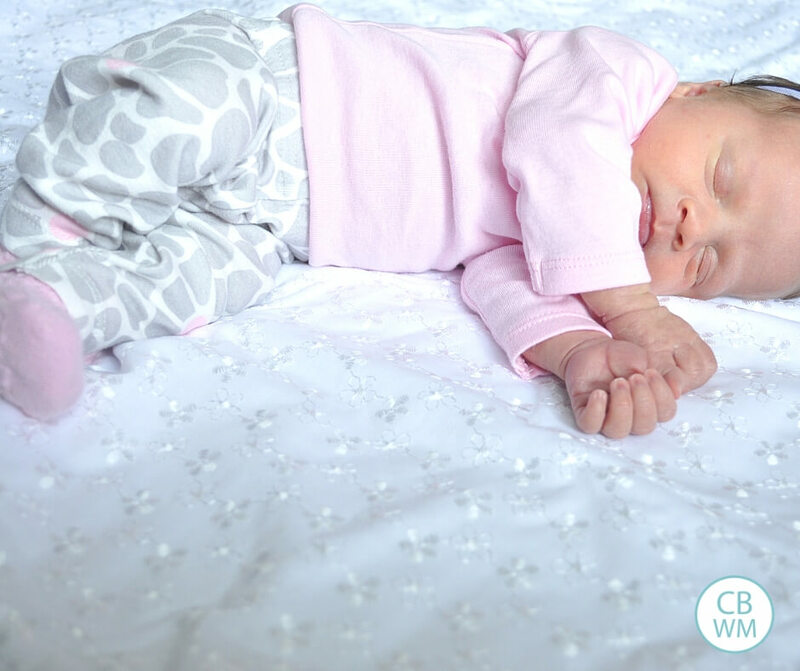 Read all about how to add waketime to your newborn’s day here. If your baby is getting enough waketime during the day, look at nap lengths. If naps are too long, baby won’t need that sleep during the night. Aim for naps to be 1.5-2.5 hours long for the most part. As a nap is getting ready to be dropped, the length can lessen to 30-45 minutes long for that one nap. You might even need to shorten the first nap or another nap during the day. If bedtime is too late or too early, baby will have a harder time with meeting your desired wakeup time. Do not underestimate the importance of bedtime! It is super, super important for getting good night sleep. Read more about the Importance of Bedtime here. Aim for betime to be about 12 hours before your desired morning wake up time. If your baby is a low sleep needs child, you might need to take that down to about 11 hours before desired morning wake up time. I have found that in most cases, the 7 PM hour (so sometime between 7-8 PM) is ideal for most babies for a bedtime. There are always outliers, but this is a good starting point. You might need to have your little one have a later bedtime. You might need an earlier bedtime. Adjusting bedtime might help your baby sleep later in the morning. If baby was sleeping through the night and stops, or if night sleep gets worse, consider dropping the dreamfeed. The dreamfeed is a great tool to get baby sleeping through your night. For some babies, the day comes that the dreamfeed starts to hurt night sleep rather than help it. One of my babies was that way. Once we dropped the dreamfeed, she went back to sleeping through the night. There is a chance your baby needs the timing of the dreamfeed changed. Some babies are so sensitive that even just moving it five minutes later will do the trick. Keep the dreamfeed in the 10 PM hour, so between 10-11 PM for most babies. Read all about When to Stop the Dreamfeed here. As baby gets older, the swaddle becomes annoying to a baby ready to move. If your baby is still swaddled and waking early in the morning, baby might need that swaddle dropped. If your baby is swaddled and breaking out of the swaddle, not being wrapped up could be the reason for the early waking also. You might need to buy a new type of swaddle blanket if baby is still in need of a swaddle and breaking out of what you have. Read up on Dropping the Swaddle here. If baby is waking right around the same time the sun is peeking through the windows in the morning, that might be what is waking baby up. Blackout curtains can easily fix that problem. Baby might be waking up because he is too hot or because he is too cold. In many instances, those early morning hours are the coldest in the home as heat has been turned down for the night and the house has cooled slowly. At other times, the heater might be turning and waking up baby. Baby might also be too hot if baby is overdressed for sleeping. Read up on how to dress baby for sleep here. As the world wakes up, noises might be waking baby up. Pay attention to what is going on when baby wakes up. Did someone’s alarm just go off? Did the neighbor just leave for work for the day? Did the shower just turn on? A sound machine can help block out noises if they are waking baby up. Teething pain can plague baby before you see a tooth at all. Consider teething pain if baby starts waking early after having slept through the night. Look at the gums and see if there is any inflammation or if there are little white spots on the gum where a tooth would come in. If it is teething, some Motrin before bedtime might help out, but it will wear out during the night. If baby was sleeping through the night and started early morning waking, consider sickness. A cold, cough, fever, ear infection, or more might be leading baby to wake up early. If this is the case, you will want to treat baby’s illness and just wait for it to pass. A note for the parents of reflux babies, as baby grows, many medications need dosage increased because it is weight based. If your baby has reflux, consider medications needing to be adjusted if baby stops sleeping through the night. If baby poops in her diaper, she will likely fully wake up and want the diaper changed (justifiably). Change the diaper without making eye contact and put baby back in bed. You might do an abbreviated sleep routine before putting baby back in bed. Consider teething. Teething can cause more frequent bowel movements. Think about solid foods. Did you add any new foods recently? Or did you switch up which foods were eaten at dinner time? There might be certain foods you just can’t give for dinner for now because they cause bowel movements too early in the morning. Maybe you figured baby was ready for a four-hour schedule or that baby needed the dreamfeed dropped. If you made a schedule change and baby stopped sleeping well, go back to the way things were when baby slept well. It is very common to make changes at the wrong time. Even seasoned moms do it because each baby is unique. Do not stress or beat yourself up. Think about the last couple of days. Did you stay out late last night or the night before? Did baby miss a nap yesterday? Was the day extra exciting and stimulating? Think about baby’s last few days. Things about those days might be leading to poor sleep for baby. As you look through this list, decide which reason is most likely to be the reason baby is having early morning wakings and then address it. If that doesn’t work, move on to the next most likely reason. Keep this up until you get it right. Your baby can get to a later wake time. You will get there! What should you do about the entire day that’s thrown off by the early waking? I’m starting Babywise late with an 8 month old who has never slept through the night. She’s improving since starting baby wise. But she’s still waking up anywhere between an hour to 30 minutes before her desired Waketime/first feeding. Should I just adjust her schedule based on the early waking and move her feedings, naps and bedtime up because of the early waking? This is a tricky age for this question. Some babies will benefit from super consistency, meaning they eat at the same times every day and nap at the same time every day no matter what. 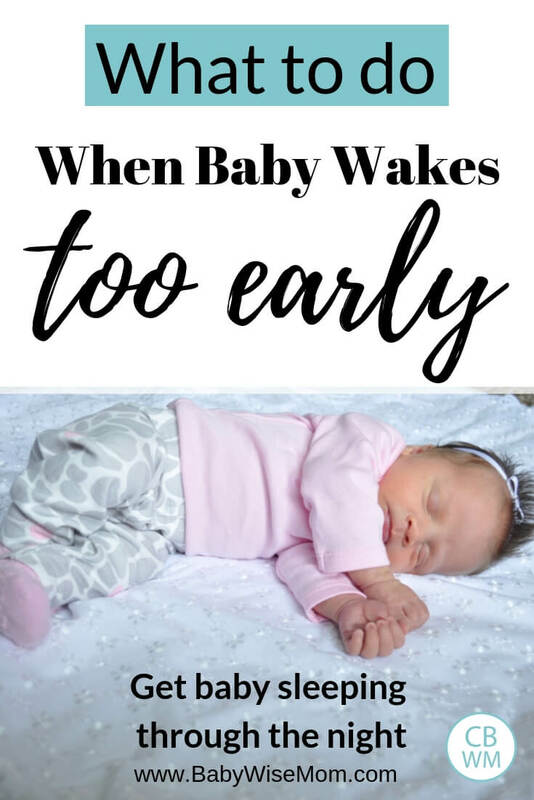 Other babies can’t quite handle a longer waketime when they wake early. Since you are starting late, I would start with super consistency and see how she reacts after a few days. She is going to need to be very consistent to be able to get on a solid schedule.